Once upon a time Little Switzerland was a sleepy little resort community along the Blue Ridge Parkway NC. Today, Little Switzerland NC is part of a rapidly developing area where a booming vacation home market is spurred on by beautiful mountain vistas, a cool summer climate and breathtaking autumn scenery. These kinds of changes are happening to communities throughout western North Carolina, threatening water quality, the wildlife habitat of the Blue Ridge Mountains, and the natural areas and scenic views of the Blue Ridge Parkway. It is why conservation successes such as the Conservation Trust’s most recent land purchase are so important. The Conservation Trust of North Carolina purchased a 25-acre property at milepost 335 of the Blue Ridge Parkway NC, near the Little Switzerland NC post office, on October 7, 2005. The property adjoins the Blue Ridge Parkway NC for approximately 2000 feet and contains the headwaters of Crabtree Creek, a designated trout stream of the NC Division of Water Quality. The property had no deed restrictions on it, making it particularly vulnerable to inappropriate development. The Conservation Trust plans to donate the property to the National Park Service for inclusion in the Parkway’s boundary. The Conservation Trust Fund purchased the property using its own funds and a generous contribution from Fred and Alice Stanback of Salisbury, NC. The property was being bid on by a developer interested in subdividing it for home sites. However, the owners, Mr. and Mrs. Sam Gross, who have a long history of concern for conservation, elected to sell the property to the Conservation Trust of North Carolina to preserve Parkway views and critical habitat for trout and other aquatic species in Crabtree Creek. “We and our agents are delighted that this acreage bordering the Parkway will be maintained in its pristine state for future generations, said Jann Godwin, owner of Timberline Properties, Inc. whose firm represented the owners in the transaction. “Our agents want to work with landowners and conservation groups to preserve the beautiful natural views of the Blue Ridge Parkway”. The Conservation Trust of North Carolina acquired the property in October 2005 and donated it for inclusion in the Blue Ridge Parkway NC in 2007. Excerpt from articles in Conserve Carolina, the newsletter of the Conservation Trust for North Carolina, Winter 2005 and the Yancey Common Times Journal newspaper article, Wed. October 19, 2005. Sitting: left to right: Ed Norvell, Attorney for Conservation Trust for North Carolina and Sam Gross, Owner and Seller of the property. 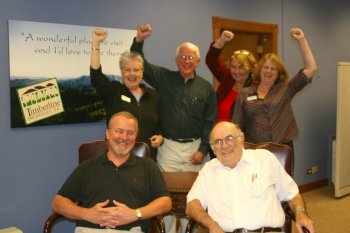 Standing: left to right:Jann Godwin, Bob Carpenter, Grace Greenlee, Penny McFee – The very happy TIMBERLINE TEAM!